Herb Magee is the all-time Division II leader in wins, a member of the Basketball Hall of Fame, and No. 3 among all NCAA men’s basketball coaches in wins, ever. 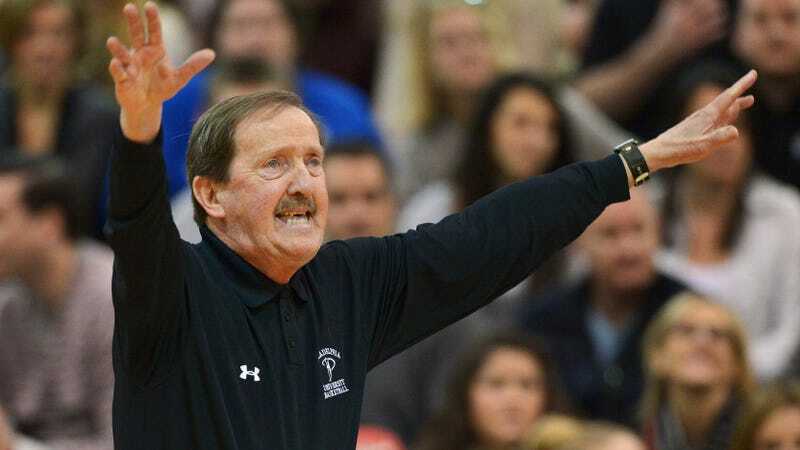 In his 51st season as the men’s basketball coach at Jefferson University—formerly known as Philadelphia University—he’s also a renowned shooting expert and has worked with NBA players Malik Rose, Charles Barkley, Evan Turner, and others. He spoke to Deadspin on Wednesday morning about Markelle Fultz’s well-documented shooting woes, because we wanted to know what he thought of the situation. Though Magee was quick to point out that he has no special information on Fultz or magical prescription for him, he shared some insights. Deadspin: I’m not sure what you’ve seen on Fultz. I watched what you sent me. I just watched it again, and I actually watched it on the bus from a game the other day. As much as you can get from watching tape. If you’re asking my opinion, the shots he’s taking now in practice look like a guy whose shoulder is bothering him. When he goes up, not at all does he finish his stroke. And then if you watch the highlights from college, when he’s making the threes, his stroke looked pretty good. He’s snapping the wrist, shooting the ball through the guide hand, all the things that you would teach. Now, I would say this to you. I would never put him in the category of a great shooter, even when he played in college. First of all, great shooters do not shoot 65 percent at the foul line. If you’re going a whole season and shooting 65 percent from the foul line, you can’t be in the category of a great shooter. The only real test for a shooter is foul shooting and three-point shooting. You can’t go by percentages. If you think back when Shaq played, he was probably shooting like 60 percent from the field and 40 percent from the foul line, (Ed. : 58 and 52) because he was shooting in-close and dunks. J.J. Redick shoots like 94 percent from the foul line, Kevin Durant, close to 90, Curry is like 93, so to think that this kid is gonna be a Steph Curry or a J.J. Redick, certainly not at this time, even if his shoulder isn’t bothering him. There’s no reason to think that he couldn’t improve, but a great shooter does not shoot 65 percent from the foul line. Those two things might be connected. It seems like there’s this theory that he knew he had to fix his free throws, but injured his shoulder in the process of doing so over the summer—at least the Sixers seem to be saying that. Have you ever heard of that happening before? Uh, no. But everything that they have in professional sports today, they certainly have medical proof. I’m going by an opinion. They have someone who really knows the structure of a shoulder and how things can be affected by changing your stroke. Now, why the kid would change his stroke, I don’t know. I know he’s not real good at the foul line, but whoever would change his stroke to look like it looked in a couple of those clips didn’t do him any favors. You can see he’s developed a hitch, and it’s more like a push shot, rather than a shot. The one that shows with his shoulder taped, you can see that as he goes to shoot, he brings it up into a position you would not do if you were a good shooter, and he kind of pushes the ball towards the basket. And the results were like—I think he shot it and completely missed the rim. That’s impossible. That’s an impossibility. I don’t know. Obviously, he has somebody that teaches him. He had the same guy in college and high school, from what I’ve read. He must have a lot of faith in the guy. Obviously, it’s in his head right now. Have you ever seen a guy who, even if he’s not a great shooter, forget how to shoot? No, no, no. I have not seen that. Especially a kid on that level. He was the top guy in the draft, he was a college All-American. And the consensus top guy, from what I understand. What’s going on with that youngster right now... I’ve seen guys go into slumps, but not someone who would drastically change his shot to the point that he would hurt his shoulder number one, and number two, that he could not make a shot. And you’ve been coaching for how long? I’ve been the head coach [at Philadelphia University, now Jefferson University] for 51 years, and during that time, I’ve worked with shooters. You know, high school kids, college kids, my own players, some guys in the NBA, and I have not seen that. It’s obvious that there’s something wrong with the shoulder, or there was something wrong with the shoulder. A few years ago, I had developed arthritis in my right shoulder. I have to lecture [and shoot] at these camps, and I couldn’t, until I worked with the trainer at our school. I had to work with the rubber bands until my shoulder got stronger, then went back to doing the lectures. It didn’t affect my shot at all, but if I did try it with the arthritis, I would have the tendency to cut it short, instead of coming up and finishing completely. The stroke is not finished until the ball is out of your hands, you have snapped your wrist, the ball’s come off the proper fingers, the ball has gone through the guide hand, and the ball is not—we have an expression with our players at school, we talk about staying on the line. That simply means stay there until you’ve completed the shot. Obviously with him, he can’t complete the shot, because it hurts. There was a report this week that a non-Sixers employee had him doing a shooting drill with balls that were three different sizes. Have you ever heard of that? Would you ever recommend that? There was a ball out at one time—I don’t see it anymore—it was simply called The Big Ball. It would fit through the basket, but it would have to go through almost perfectly. I don’t think that was such a bad idea, because the ball was the same weight. For example, if I teach a young girl shooting, I sometimes will have her take the men’s ball and shoot it for a few minutes before going back to the women’s ball. Psychologically, it then seems like it’s easier to put it in. So no, not three different size balls, but if they’re the same weight, that’s not a bad idea. The Sixers have been saying that his range is only in the paint, and that he needs to “completely rebuild his muscle memory.” How could you completely lose your muscle memory? And how would you go about rebuilding it from scratch? The biggest mistake people make with their shot—because they started when they were little—is they shoot two-handed. When they grow up, the guide hand is the thing that will hurt the shot if you don’t have it on the ball in the right place. So when they worked with Nerlens Noel shooting with one hand, it helped him. I don’t think he’s ever gonna be a great shooter, but not using his guide hand for a year helped him. All that stuff is good, but I would say this to you: If the Sixers are doing certain things with him, then I would completely agree with it. I know Billy very well, and I’ve gotten to know Brett very well, and Brett is actually a shooting guy. He teaches shooting himself, and he has a young son—I’ve never seen him play, but he’s supposedly a heck of a shooter. I think the problem with Fultz is simply in his head. I think the only way to get it out of his head would be working in closely, shooting one-handed, and try to rebuild it right from the ground. I’ve never heard of it, I will say that to you. I’ve never heard of a guy on his level, and a guy as accomplished as he was in college just completely lose his shot. Whatever they’re doing with him, that probably is the right thing to do. The folks who run the Sixers know what they’re doing. I haven’t seen him play [in the NBA], but his athletic ability, just watching him do drills... you sent something that was him playing against Yale, his smoothness on the court was very impressive. He can get places, that’s for sure. But if you get places, you better be able to make shots. Unless you’re like Ben Simmons, who can get there and dunk it. Fultz is a guard. Ben Simmons is a guard, but he’s a revolutionary guard, more like LeBron James. But Fultz is a slasher type of kid. He needs a jump shot, he really does. And you’re gonna get fouled, and you gotta make foul shots. Have you ever worked with a guy where the fix was off the court? Like, I think the move here might be sending him to a psychologist or a therapist. Have you ever done that? No, I never really have. The guys I’ve worked with—you remember Malik Rose? Malik got drafted, and he was a forward, sometimes a center at Drexel in college. And when he went to the Spurs, they had David Robinson and Tim Duncan at center. He called me, and we worked together in the gym for a full summer. When people ask me who’s the best student I’ve ever had, including your own players, I would say it was Malik Rose. He went back and he really improved, and was a valuable member of that San Antonio team, because he could make a jumpshot, and he would make his fouls. The number one thing when you’re teaching anybody is: the guy who’s being taught must agree completely that he needs help. Number two, the person who’s teaching had better know what they’re doing. Number three, is the person learning willing to practice in the gym for hour after hour? If you do those things, then I think anybody can improve, to be honest with you. A lot of guys are not willing to admit that their shot needs help, and the person who’s teaching them better know what they’re doing and not show them the wrong way. I always equate shooting a basketball with hitting a golf ball. I could go out right now and hit like 2,000 golf balls and I won’t get any better, because I don’t know what the hell I’m doing. What I need is a pro to show me how to do it, and then hit those 2,000 balls. I am sure that he’ll get better. If his shoulder’s better, he’ll get better. I’m sure the Sixers’ shooting coach knows what he’s doing, or he wouldn’t be there. By the way, there’s really not a lot of mystery to it. You might be a basketball guy, or you might not be a basketball guy, but if you watch that stroke, you say, “something’s wrong with that.” I mean, that doesn’t look right. That just doesn’t look right. He’s a tough guy, it sounds like. He didn’t want to admit he was hurt, and it never got better, but maybe it is now, but he’s stuck with that shot. He should be able to overcome that. If his shoulder’s fine, he should be able to overcome what it looks like now when you see him practice. I don’t think there’s any major mystery to it, and I’m sure the kid’s going to overcome it. I’d just like to see him play. I don’t have the answers; I’ve never been in the gym with the kid. But you can see it’s wearing on him.